“Declare a holy fast; call a sacred assembly” (Joel 1:14). We extend our apostolic benediction and greetings to our brethren, His Beatitude Mor Baselius Thomas I, Catholicos of India, and their Eminences the Metropolitans; our spiritual children the reverent priests, monks, nuns, deacons and deaconesses and out blessed Syrian Orthodox people all over the world. May the divine providence embrace all through the intercession of the Virgin Mary, the Mother of God, and St. Peter, the chief of the apostles, and the rest of the Martyrs and Saints. Amen. Here comes the time of the Great Lent. This is a golden occasion offered by our holy mother church, at time to examine our souls. It is a time to avoid vice and cling to virtue. It sis a time to return to God in repentance: “In an acceptable time I heard you and on the day of salvation I helped you” (II Corinthians 6: 2). As the eagle trains his small children to fly high in the sky, the holy church teaches the faithful to soar in the spiritual skies. The holy church provides them with the grace to escape earth and the things that pull them downwards. The church seeks to overcome the difficulties of spiritual life so that the faithful grow in the life of virtue to the peak of evangelical perfection through the suppression of the lowly bodily desires: “Do not work for food that spoils, but for food that endures to eternal life” (John 6: 27). During Lent, the faithful fast from eating food for a certain time: then they eat light fasting food voluntarily. Thus, their hearts beat with holiness and they grow from power to power through the submission of the body to the Spirit “For the body desires what is contrary to the Spirit, and the Spirit what is contrary to the body. They are in conflict with each other, so that you do not do what you want” (Galatians 5: 17) as St. Paul puts it. Through fasting, the faithful are able to avoid the desires of the body and do the good deeds they desire to do. Indeed, God established fasting: He commanded it to the first man. When he broke this commandment, he fell into sin and deserved death. After being so close to God, man was driven far away from Him. He even hid from His holy face and could not see Him anymore (Genesis 3: 8) because he had disobeyed His divine orders and had not kept the fast commanded to him. To please God, the forefathers and prophets fasted in different ways. God ordered Moses to sanctify himself reaching Mount Sinai to receive the commandments (Exodus 19: 1-25). Moses fasted forty days and forty nights (Exodus 34: 28). He found grace in the eyes of God and was worthy to see His glory (Exodus 33: 13 and 18); he brought down the law for the people. The prophet Elijah fasted forty days and forty nights (I Kings 19: 8); he triumphed over the pagan priests and attracted the people to the law; consequently, he merited being taken to heaven in a chariot of fire. The prophet Daniel fasted three weeks during which he did not eat meat of drink wine (Daniel 10: 2). He was thus able to keep the jaws of the lions shut and they did not hurt him. The people of Nineveh fasted with their children and cattle (Jonas 3: 7). As a result, God accepted their repentance and their city was saved from destruction. The forefathers and good prophets practiced the virtue of fasting as a way to please God and to avoid sins, especially during crisis and temptation. Our Lord Jesus Christ taught us how to fast; he fasted for us forty days and forty nights, and when he finally felt hungry (Matthew 4: 2) he was tempted by Satan. He defeated Satan and gave us the secret of the victory over Satan and his powers saying: “But this kind does not go out except by prayer and fasting” (Matthew 17: 21). When He was asked why His disciples ignored fasting – as claimed by their enemies – He replies that His disciples should fast when He ascends to the heavens saying: “But someday the from will be taken away from them, and then they will fast” (Matthew 9: 16). In another place, He ascends to the heavens saying: “But someday the groom will be taken away from them, and then fasting should be, saying: “When you fast, do not look somber as the hypocrites do” (Matthew 6: 16). Furthermore, we learn from the Acts of the Apostles that the Disciples observed fasting especially before the election of leaders and during persecutions, wars and plagues. Paul also fasted continuously (cf. II Corinthians 6: 5 and 11: 27 and Acts 27: 33). The disciples taught the faithful how to fast. The church took this from them and ordered additional fasting. The history of the church shows that Christians observed the Great Lent since the dawn of Christianity along with fasting during the Week of Passion and Wednesdays and Fridays on a weekly basis. The laws of the church punished the clergy and faithful who broke the commandment of fasting. Exceptions were made for old people, babies, the sick, menstruating and pregnant women: these exceptions were not some sort of luxury, but were borne out of necessity. Saturdays and Sundays are not complete Eucharist, the one who fasts, breaks his fast and receives food. 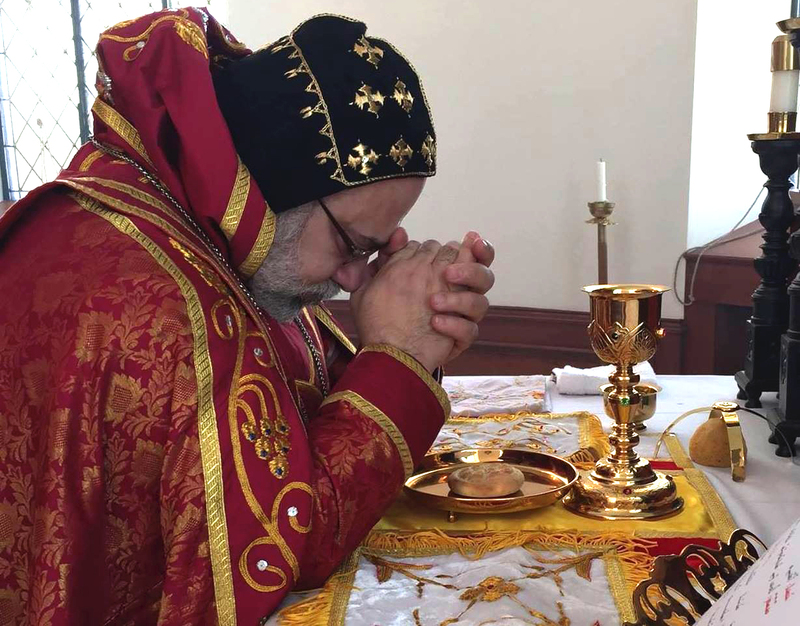 As a way of sanctifying Sundays, our Holy Syrian Church does not start Lent on Sundays: if it happens that Lent starts on Sunday, as a respect for the “Lord’s Day’ we start on Monday decreasing thus the number of fasting days by one. The Holy Church does not prescribe the types of food to eat and ones to avoid on a particular day. The aim of fasting is submission of the faithful to God’s will through piety and the exercise of virtues, especially that of obedience to the commandments of God spoken through the tongues of the bishops who have been given authority to legislate laws and to bind and loose. They make rules for the benefit of the faithful and for the glory of His Holy Name. Since the church is a loving and caring mother and good teacher, she does not put heavy burdens on the faithful which they cannot life, according to the Lord’s words: “You experts in the law, woe to you, because you load people down with burdens they can hardly carry, and you yourselves will not lift one finger to help them” (Luke 11: 46). Consequently, the Late Lamented Patriarch Elias III (1932) allowed the eating of fish during the Great Lent. In addition, he allowed the faithful in America to fast only the first and last week of the Great Lent, in addition to Wednesdays and Fridays. Similarly, the Late Lamented Patriarch Aphrem Barsoum (1957) allowed the same for the Indian Church, as well as decreasing the number of fasting days for all in 1946. Furthermore, the Late Lamented Patriarch Jacob III (+1980) allowed the fasting of only the first and last week of the Great Lent as well as Wednesdays and Fridays for the clergy and people. In 1966 he permitted the use of all sots of food on the rest of the days. He also allowed feasts, weddings, baptisms, the Divine Liturgy and commemorations to be celebrated on any day that falls in that period between the two aforementioned weeks. The permission of our predecessors, the holy patriarchs, allowing the decreasing of the days of the Great Lent for the faithful comes as an act of mercy and compassion so that they do not break the commandment and incur God’s wrath – God forbid. Hence, those who make use of this allowance are not sinning and are not considered among those who break the law. Al for those who fast all the days of the Great Lent and the Week of Passion, God shall multiply their rewards. Dearly beloved, we are called to follow our righteous forefathers, abiding by the teachings of the Holy Bible: “Remember your leaders, who spoke the work of God to you. Consider the outcome of their way of life and imitate their faith” (Hebrews 13: 7). We shall abide by it especially that we live in a period when faith is about to be extinguished in our hearts, love is frozen in our veins and we have neglected our duties of fasting and prayers. Nowadays, we are more materialistic; we have neglected charity work and are the concrete example of the unfaithful whose “God is their stomach, and their glory is in their shame” (Phillippians 3: 19). This is the alarm bell that rings and alerts us to the danger, that of the separation from God. Let us hear the Lord speak through the tongue of the prophet Joel: “Declare a holy fast; call a sacred assembly…Rend your heart and not your garments” (Joel 1: 14 and 2: 13). Let us fast and acceptable Lent, not only from food and drink, but also from evil deeds and sins. Let our thoughts fast from evil imagination, our tongues fast from meaningless utterances, our bodies from hideous desires; let our wills be submitted to God’s and our fasting be acceptable to Him in the words of the prophet Isaiah; “Is not this the kind of fasting I have chosen: to loose the chains of injustice and untie the cords of the yoke, to set the oppressed free and break every yoke? Is it not to share your food with the hungry and to provide the poor wanderer with shelter…Then you will call, and the LORD will answer; you will cry for help, and he will say: Here am I” (Isaiah 58: 6-9). May the Lord accept your fasting, prayers, charity and repentance. May He make you worthy to celebrate the glory of His resurrection in joy, happiness and good health. May He also have mercy on our faithful departed through the intercession of the Virgin Mary, Mother of God, and St. Peter, the chief of the apostles, and the rest of the Martyrs and Saints, and God bless you. Which is the 30th year of our Patriarchate.